PARK SLOPE — A half-dozen buildings will soon be torn down to make way for yet another new high-rise on rapidly changing Fourth Avenue. 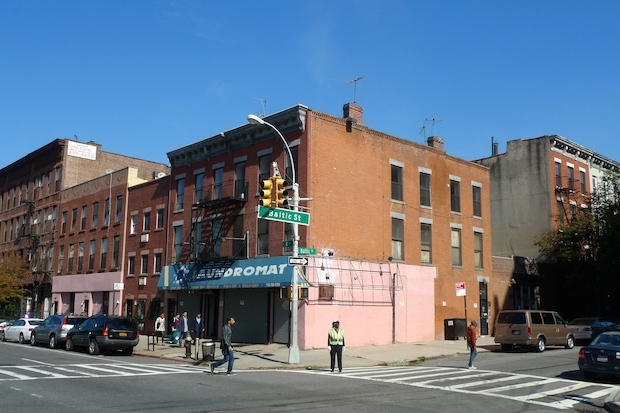 JDS Development Group recently applied for permits to demolish six residential low-rises at Fourth Avenue and Baltic Street and expects to begin construction next year on an 11-story building there, a company spokesman said. The buildings slated to be pulled down are at 107, 109, 109A and 111 Fourth Ave., and 615 and 617 Baltic St. If the permits are approved, JDS plans to complete the demolitions by the end of the year, the spokesman said. The buildings are three- and four-story walk-ups built in 1900 and 1920, according to city records. The new tower is among several residential projects in the works for the busy thoroughfare. An 11-story building is planned two blocks away at Douglass Street and work is underway to replace a McDonald's with luxury apartments at 275 Fourth Ave.
Renderings aren't yet available for JDS Development's new building, but the company specializes in high-end residential real estate and is known for high-profile projects such as Chelsea's Walker Tower, where a penthouse apartment was on the market for $47.5 million. JDS bought the six buildings at Fourth Avenue and Baltic Street earlier this year as part of an effort to add "diversity" to its portfolio, managing partner Michael Stern told Crain's New York. The company also built 202 Eighth St. in Park Slope, another new high-rise just off Fourth Avenue, where rents for three-bedroom apartments started at $8,500 a month.